The Prestige changes will be due to switching from chunk to plot resolution. I will write a post now to explain for everyone. My experience goes further than this: Character A founded a guild and joined another. Character B (my main) Joined the same 2 guilds as character A plus an additional one. Character B can only message the 2 guilds that Character A is in as character A and can’t message the third guild at all. Not sure if character B can see messages from the 3rd guild or not. Update on world stability and guild channels. Confirmed that the Right Warp in the Sanctum doesn’t work as expected. Aligning my home beacon into my guild made it Show up twice in the world/setllement score list. I found that linking my beacons to a guild cleared all privileges I had given to my alts, one of which is also in the same guild. I’m not sure if it was intended, but I could see it getting tedious for people with very long friends lists. Edit: Seems that unaffiliating them with a guild may have actually cause this to happen. This is probably a display bug, but aligning your beacon to a guild for the first time will transfer most of the plots and prestige to the guild director. unaligning then realigning fixes it. Can not open a warp to a location. When I place Warp Conduits, select a location and click “Open Warp” the menu closes, then a second later the menu opens again to the locations list. On Lasaina settlement 2 & 3 are the same settlement but with 1 prestige the difference, and 4 & 5 have the same prestige, but different names. 4 & 5 also represent the same settlement. There is a fix locally for the main issue of not receiving footfall now, so should be updated for live in next hot fix. There are secondary issues for footfall that are not bugs, but just “bad gui” that may cause confusion here as well. 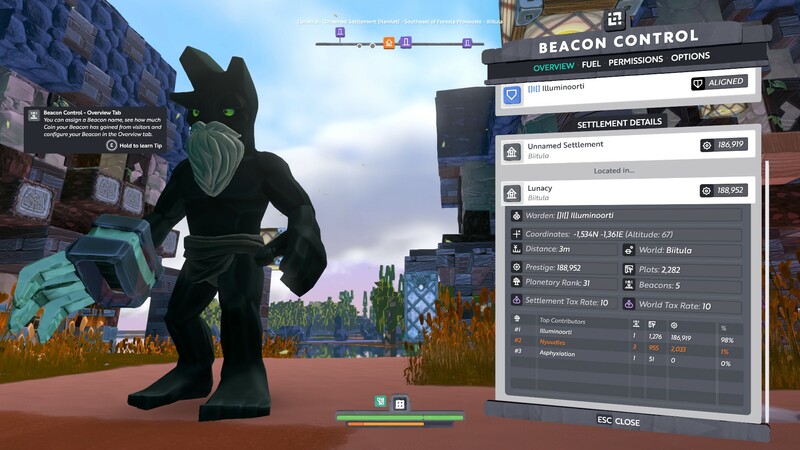 One of the release notes mentioned that footfall requires the “beacon” to have 10,000 prestige as well as being in a settlement, otherwise you will get 0. 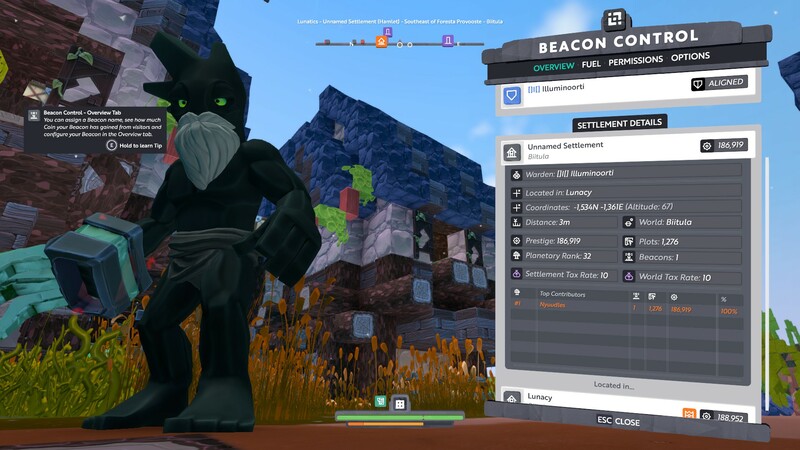 Previously you simply had to be part of a settlement, and if your beacon had little prestige, it would get a reduced amount of footfall, but not 0. With the change to 0, users may be confused that they get no prestige (especially as the gui implies they will get 30 coins per visitor still). There are some other more minor gui lack of details that hopefully can be improved soon as well.